I did some exploration in early November at a multitude of sites in the Snoqualmie Valley and middle fork of the Snoqualmie River. I was surprised by a few things: the incredible amount of water everywhere and the passing of the leaves in the upper part of the valley (they are essentially gone). Autumn is definitely on its way out, but winter has yet to make its appearance. Small streams along the middle fork trail were to my judgment impassable because they turned into rivers and the middle fork itself was as high as I have ever seen it, and Snoqualmie Falls a raging torrent barely visible through the scattered mist. 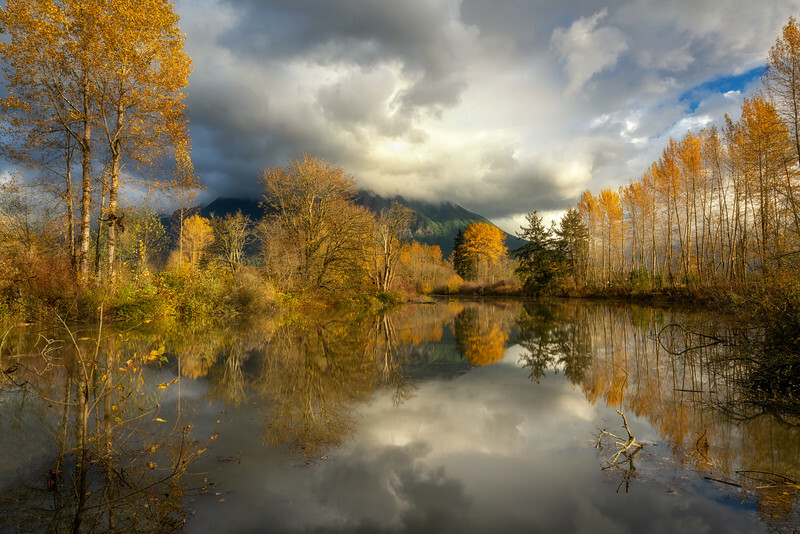 I closed my day at this reflecting pond in the Snoqualmie Valley where some gorgeous light made its way through the clouds illuminating the remnants of the Autumn Leaves.